The Jennie Award is named after Jane Cunningham Croly, the founder of GFWC who worked as a journalist using the pen name “Jennie June.” The women honored with this award are a true reflection of the spirit of GFWC’s founder, whose independence and courage led her to form the General Federation of Women’s Clubs in 1890. As the only award at the Federation level that recognizes individuals for their service, it is truly the highest honor a clubwoman can receive. Much like Jennie June, these women are committed to improving the lives of those around them. They live and breathe volunteer service, and are completely devoted to their clubs, communities, and families. Stay tuned for next week’s blog post featuring Western States Region Jennie Award Winner Bessie Konishi! GFWC is proud to announce that Janice Carter of El Dorado Springs, Missouri, is the 2016 Mississippi Valley Region recipient of the Jennie Award, a medal of honor given to only eight of the nearly 100,000 clubwomen worldwide. Janice celebrated these accomplishments with her family and fellow clubwomen at the Wonderful, Wacky Women Luncheon on June 28 at the 2016 GFWC Annual Convention in Baltimore, Maryland. Janice joined the GFWC Generation III Club in 1983 and has held nearly every leadership position within the club. She is an active member on the local, state, and national level, and was recognized as clubwoman of the year in El Dorado Springs. She started the club’s Nursing Home Christmas Project over thirty years ago, organizes the annual salad supper and auction to benefit Missouri Girls Town, and provided the first anatomically correct baby doll for home economics classes at the local high school. Janice is known as the “Federation Lady,” planning two club meetings each year revolving around GFWC on a national level. At these meetings, Janice educates local members about the benefits of belonging to GFWC and shares accomplishments of the Federation. Because of Janice, clubwomen in her community learn about how GFWC works on both the local and national levels. Janice led the club in the painting of Bulldog Paw Prints to support the local high school, helping visitors find the football field and basketball court. Through the Nursing Home Christmas Project, Janice makes sure that every resident of local nursing homes receives a homemade Christmas card. Whether organizing a Halloween carnival for local children, planning a little Mr. and Miss Santa Contest, or painting bleachers for community ball fields, Janice isn’t afraid of hard work. “Janice is a true role model that defines membership and leadership. I have never seen her without a smile on her face, always looking at the bright side,” said Jessica Frier, president of GFWC Generation III. 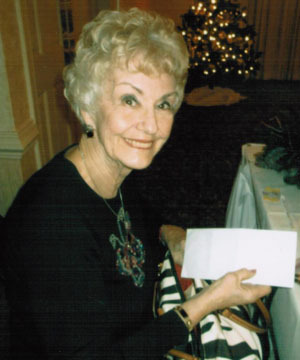 In addition to her leadership in GFWC, Janice is active in numerous community organizations. As a two-time ovarian cancer survivor, Janice provides support to those fighting cancer as the founder, treasurer and facilitator of the High Hopes Cancer Support Group and a team captain for Relay for Life. She is a charter member of Friends of the Library, and was instrumental in helping the library find a new location. She continues to serve as treasurer of the group. Janice is also a charter member of the Preserve Our Past society and the Fraternal Order of Eagles Auxiliary. “Her positive attitude is contagious. She commits her life to family, club, and community. Volunteering is second nature to her; she has always been there to help and will continue to be, in any capacity she feels necessary,” Jessica said.